It has been a tradition since past few years to welcome a New Year with a black eyed pea post. Last year it was scrambled eggs, the year before with some fried fritters (still a popular one for New Year's) and a curry with coconut, the year before that. The reason is simple - in some cultures, black eyed peas symbolize good luck due to their penny-like appearance. They also signify abundance and if there are any left overs for the day after, it is meant to demonstrate frugality and prosperity in the coming year! Don't get me wrong. I am not a stickler when it comes to any kind of customs or superstitions but it is always a good feeling to start something on a good note. Isn't it? Today's recipe is a vegan curry made with coconut milk and some aromatic spices. 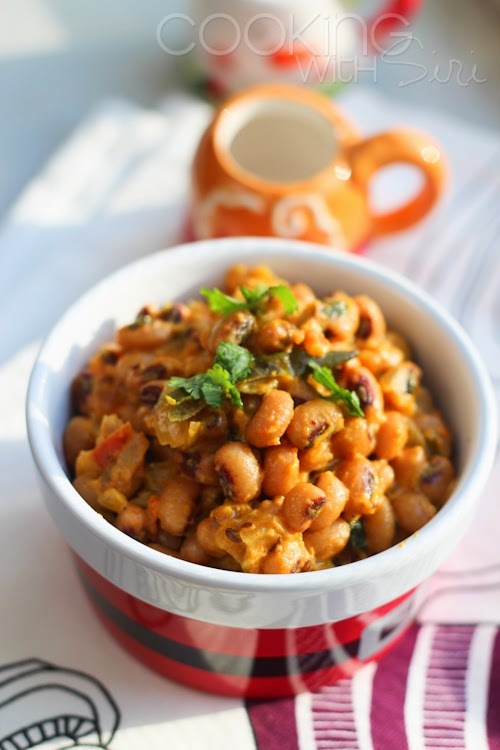 New Year's or not, this recipe comes together in a giffy, any kind of beans like red, garbanzo etc can be substituted instead of black eyed peas and it will still taste heavenly. Enjoy. I chanced upon the beautiful quote below while reading the book 'The Gifts of Imperfection' by Brene Brown. "Joy seems to me a step beyond happiness. Happiness is a sort of atmosphere you can live in sometimes when you're lucky. Joy is a light that fills you with hope and faith and love." ..and that is what I am wishing the coming years bring in - for you and for me. Our lives to be filled with joy and also we have the wisdom to differentiate between what is wrong and what is right. I picked up this book expecting nothing but I have to tell you how pleasantly surprised I am as I leaf through the pages. To give you an idea, the author is a shame researcher (didn't know previously that people devote their lives to delve on such less-talked about emotion) and the book is divided into 10 guide posts, each exploring aspects like authenticity, resilience, gratitude, joy etc and how to cultivate them. The premise I presented here might sound boring and something we already know about but trust me, most of the times what seems obvious is the most neglected. I am currently reading about creativity and have couple of more guideposts to reach before the books has to be returned to the library! Reading more is one of my 2015 resolutions and am happy to report that so far it has been going good. On another note, did you know Mark Zuckerberg started his own book club? Guess, am definitely not alone in reading more resolution for 2015. Heat oil in a pan and add onion. Cook until the onion has begin to turn golden. Then add the garlic, ginger, coriander powder, turmeric, cumin powder and red chilli powder. Cook the mixture for about 1-2 minutes. 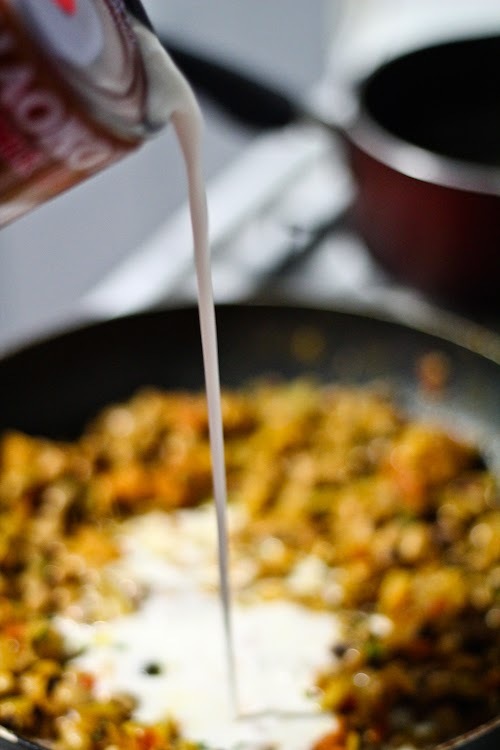 Add tomato along with its juices to the saucepan and cook until it becomes a mushy mixture. Add black-eyed peas, salt, sugar and coconut milk and stir to mix. Cover and stirring occasionally cook for about 20 minutes until the sauce thickens. Add lemon juice and chopped cilantro. Mix and cook for another minute. Adjust seasoning and Serve hot with bread or rice, garnished with a few more cilantro leaves. 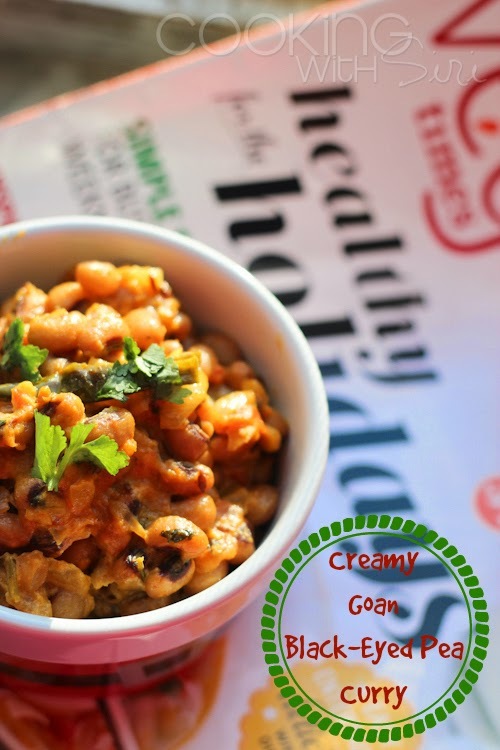 Sending this recipe as an entry to my favorite virtual foodie event - My Legume Love Affair # 79, this month hosted by Lisa and original concept by Susan. Lovely way to prepare black eyes. I make a very similar dish myself. Thanks for sharing with MLLA. And Happy New Year Siri. I clicked through MLLA and love this. I have made something similar and it was great. Good luck with more reading. My favourite book is The Unbearable Lightness of Being. Just a quick note. The MLLA roundup is a bit late this month, but I'm working on it. As for my favorite book, I guess I would have to say Crime and Punishment. One gets to learn something new every day! I had no clue about the black eyed pea belief! it's not too late to still give it a try since we are still in Feb ;) I have been reading less and less since I got hitched. And when I do read I usually reread some favourites (Jane Austen , Conan Doyle and well too many to list) I should really strive to read more new world material. Wishing us a healthy, happy and prosperous year!